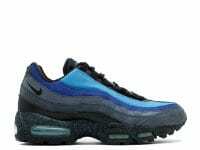 The Nike “Air Max 95” (aka “Air Max 1995”) was the first version to feature visible Air in the forefoot. While the color of the original laces will depend on the pack / colorway / release, the OG shoelace style and sizing is the same across all. 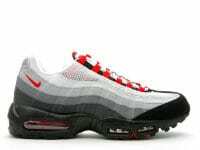 The Air Max 95 come equipped with standard, ropes made of cotton / poly blend, generally between 45 and 54 inches (137 CM). If you prefer to wear your laces untied, we recommend going with a slightly shorter, 50 inch shoelace – it’s a better fit for laid back styles. 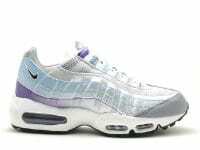 Designed by Sergio Lozano, the Nike Air Max 95 marked a big shift in the performance running sneaker market at the time. With its distinct rippled design across its upper, gradient gray color scheme, and bright neon yellow accents; the 95s brought a bold, provocative silhouette that had not been preceded by any sneaker before its time. As basketball shoes began to be the number one sellers for Nike, surpassing runners, the team brought in Sergio Lozano to help curve the trend. Lozano positioned the revolutionary Air Max 95 project as a means to recapture the public’s attention towards the performance running category. Inspiration behind the creation of the 95 came from one rainy day in Nike headquarters’, where Lozano pictured the process of rain eroding the earth. In addition he incorporated ideas from the anatomy of the human body, where the forms of human muscles and vertebrae were locked into the design. 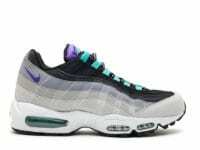 Loved my 95s – gonna try and give them new life based on this.